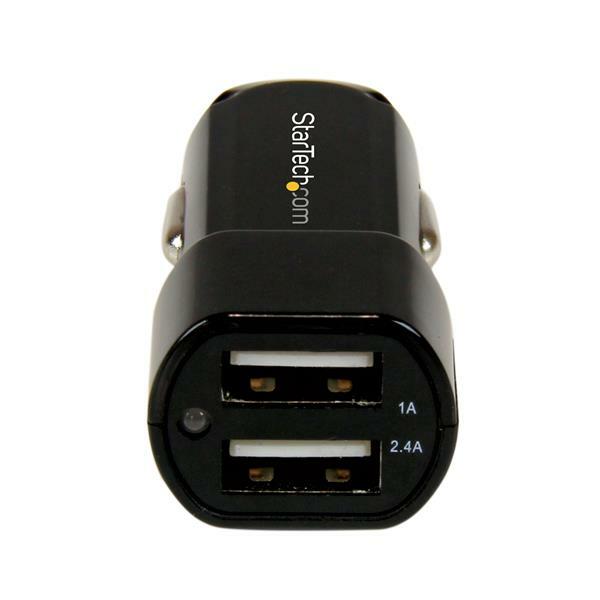 The USB2PCARBK Dual Port USB Car Charger features two USB 2.0 ports and works with any standard car AUX power outlet, enabling you to charge two mobile devices simultaneously while you commute for work or play. With a 1A port for charging your Smartphone or iPhone, and a 2.4A port for charging your iPad or other tablet, you can always be sure you have the correct charge available for all your mobile devices. Having the second USB charge port available means you can charge two phones simultaneously and even make sure both you and your passenger are fully charged and ready to go. Plus, your passenger can charge and text, work or game while their device is charging. This durable USB car charger adapter is backed by StarTech.com's 2-year Warranty to ensure dependable performance. 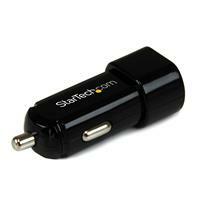 Unlike many of the cheaper USB car chargers, this one is not only compact, but it is also robust! This is a case of spending a little more to get a lot in return!